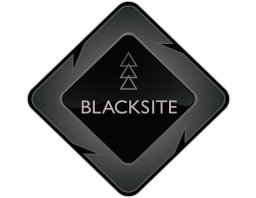 Following the Danger Zone update, a secret was found within the Blacksite. This is a reference to the song "Still Alive" from the Valve game Portal, leading to speculation that this may tie into a third Portal release. In-game there are several "three trees" logos that resemble the white forest logo in Half-Life 2: Episode 2. These experiment_decals_0X textures are found in Blacksite's texture folder, hr_massive, (hr = hi-resolution, massive = the internal name for Blacksite). There is a wristband model in the update (models\weapons\v_models\arms\wristband) that also bears the text "EXPERIMENT 12"
Throughout the map there is various imagery, some of it quite dark or edgy. Some of it has equivalent weapon skins. signage_message_01: This one is similar to the "Lab Rats" weapon skin and the CS:GO twitter's profile banner art. On Blacksite there is an info kiosk model, however in-game it is empty. Contained within Blacksite's texture folder, there is a texture: survival_info_kiosk_color. The text in it is blacked out, but brightening the image allows most of it to be revealed. 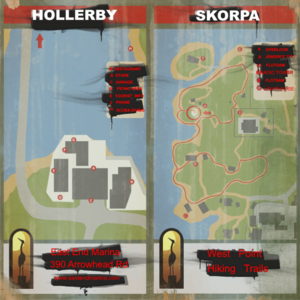 The kiosk texture with blacked out text restored. The kiosk, in game, notably empty. The image links to the website eastendmarina.com among other things mentioned. This site is currently considered a gamejacking attempt, and anything on it should be disregarded in the context of this ARG. The reason it is thought to be a gamejacking attempt is because Valve registers their sites with Network Solutions, while eastendmarina.com was registered with NameCheap. It was also registered on 2018-12-09, after the URL has been found. 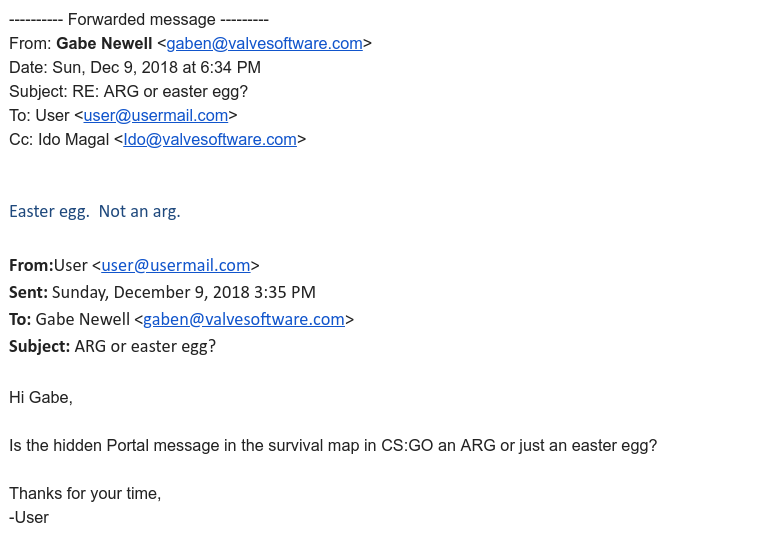 While further investigation took place, a user emailed Gabe Newell about the discoveries. The response Gabe sent was met with some suspicion, but has since been confirmed to be genuine. The user's name has been edited out to preserve anonymity. As such, the investigation is considered complete. This page was last edited on 10 December 2018, at 00:40.